Southwest and AirTran have some empty seats to push, and I'm waiting with open arms. Fly across the country for as little as $55 one way. One drawback? Book fast because this sale ends on May 16. These sales are for travel through June 25, and the only restrictions are the blackout dates - May 24, 31; June 2, 7, 9, 14, 16, 21, 23. Granted, the weekend flights will book the fastest, but that depends on whether you're heading to Vegas or Akron. Click here to see the full list of fares at Southwest Airlines. 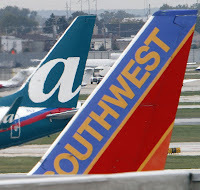 Click here to see the full list of fares at AirTran Airways.